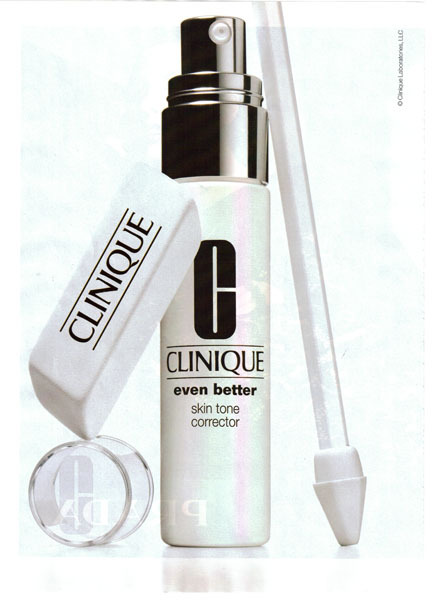 This is an ad for Clinique Even Better Skin Tone Corrector (it’s really called that) and was found in a fashion magazine. Imagine erasing past damage to create a more even skin tone. In fact, Clinique guiding dermatologist Dr. Orentreich says, “When skin is more even-toned, you look younger.” So here’s your second chance. To virtually undo the visible evidence of sun damage, dark patches, age spots, even the inevitable darkening that follows acne scarring. Basically, give skin a clean slate. Create brightness and clarity for all ethnicities. Turn back the odometer. Our new skin tone corrector does all that – gently. Use it twice a day on face, chest, hands. See results in about 4 to 6 weeks. One caution: daily sunscreen’s a must. It’s a fresh start – not a free ride. If you don’t regularly use erasers, think back to when you did. Particularly think about the kinds of erasers pictured in the ad. How effective are/were they? Right. If your erasers are/were generally about as effective as mine, you’ll see why I’m not sure those are the best images to evoke in this ad. It’s also a bad idea because with the arrangement of the image, I first thought they were actual erasers that were part of the product. The other thing this ad made me think was that the makers of this product really don’t like dark skin. Now, you may be going “well, duh, it’s a product designed to lighten the dark parts of your skin.” But what if all of your skin is dark? What if your skin is normally dark? What if you aren’t white (unlike the snowy white ad seems to assume skin should be)? The ad specifically says the product is designed for all ethnicities, but it doesn’t actually feel like it to me. It feels to me like it’s either just saying that, when it’s really designed for white people, or it’s designed for other skin tones in that it will attempt to lighten their skin. Which kind of misses the point. Either way, I don’t think this conveys the “for all ethnicities” message well at all. I think this is a pretty terrible ad all-around. The image is awful, the imagery doesn’t really work and it doesn’t seem to actually give an impression of valuing skin tones that aren’t naturally light, despite claiming it’s for them too. Oh, and the “factual” statement isn’t a fact at all, it’s a value judgement – an opinion. Just because it’s an opinion from a doctor doesn’t make it any more factual. If it was coming from a psychologist or sociologist who ran studies on how people react to other people with varying skin tones, then it *might* be something approximating a fact, but coming from a dermatologist working for a make-up company it’s decidedly not. Sorry. Oh, and nothing is “100% fragrance free”. Trust me. This entry was posted on March 3, 2010 at 12:00 pm	and is filed under Beauty. 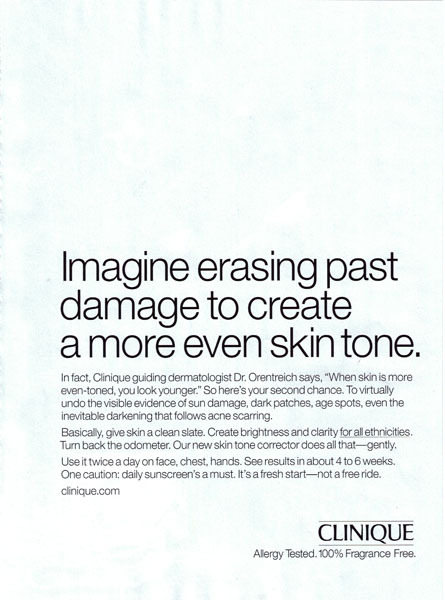 Tagged: clinique, even-better-skin-tone-corrector, print-ad, skin-care. You can follow any responses to this entry through the RSS 2.0 feed. You can leave a response, or trackback from your own site.